This DIY wood butter recipe is a must have item for anyone who does a lot of cooking from scratch. I have about 10 cutting boards in all shapes and sizes and they are looking their age! There are gigantic ones for rolling out pie crusts (which I HATE doing!). I have tiny ones for chopping up a jalapeno from the garden to put on our pizza. When you wash wood cutting boards multiple times a day, they get dried out fairly quickly. What happens when your cutting board gets dried out? They split in half and you are left with very expensive fire wood for the next campfire! My cutting boards were in serious need of attention this week so I decided it was time to clean, sanitize and moisturize them with some homemade board butter! 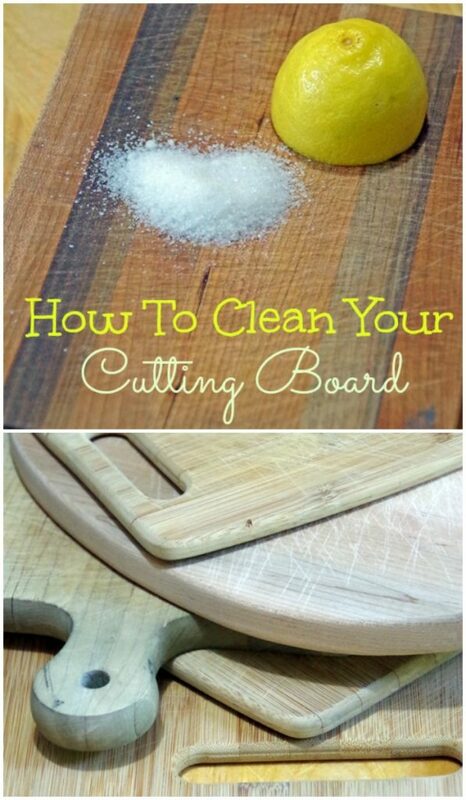 I included a few tips for cleaning cutting boards that may be helpful as well. A cutting board and homemade wood butter would make a wonderful sustainable gift idea for family and friends. Should You Use Mineral Oil on Wood Cutting Boards? If you are as much of a cutting board user as I am you need to make sure you take care of them properly. Ignoring your cutting boards for too long will just ensure that you need to buy yourself a few new cutting boards way too often! 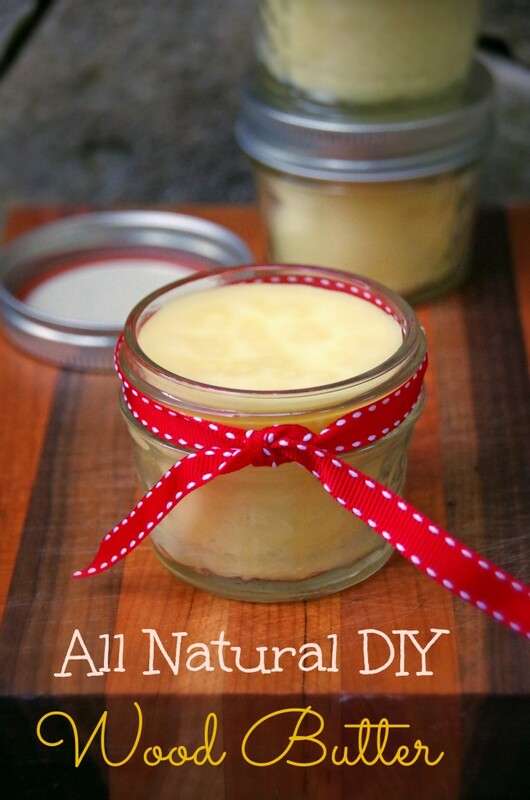 I made this all natural wood butter recipe using coconut oil, beeswax, and a couple of my favorite essential oils. Some people moisturize their cutting boards with mineral oil but that is a petroleum-based product that I don’t really want anywhere near my food. This wood butter recipe is all natural with nothing harmful that could stick around on your cutting board and contaminate your food! Before you moisturize your cutting boards with this DIY wood butter recipe, spend some time cleaning cutting boards first. 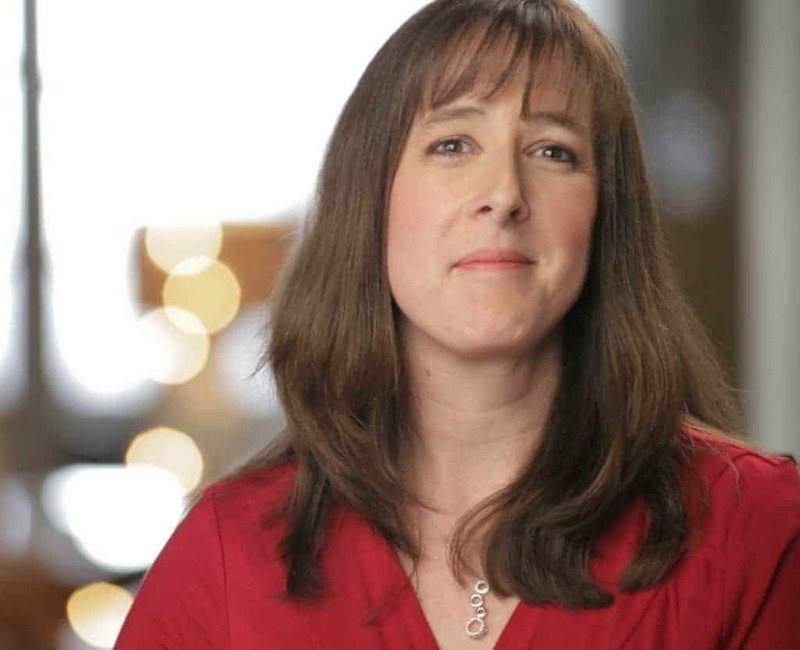 Make it a part of your frugal spring cleaning this year. Sprinkle them liberally with some Kosher salt and scrub them with half a lemon. 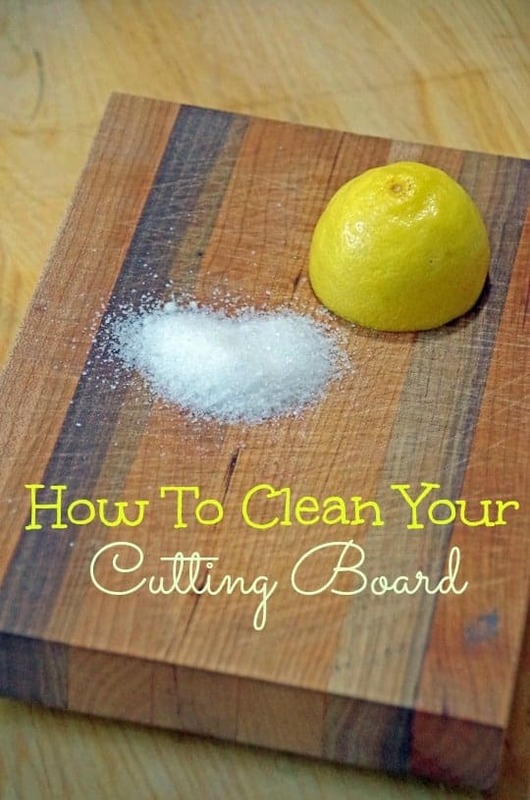 Squeeze a bit of lemon juice onto the board as you scrub. The salt is a great way to scrub off any particulates. The lemon juice sanitizes and helps remove odors. Once they are scrubbed and wet, let the salt/lemon juice mixture sit there for a minute. Make sure you rinse them thoroughly. Dry them with a towel and let them air dry for a couple of hours before you moisturize them with the wood butter. You want the cutting board completely dry before you start moisturizing. To make this wood butter you only need a few simple things. You will need a good, high-quality virgin coconut oil. Coconut oil doesn’t go rancid as easily as some other oils so it is a good choice for cleaning and moisturizing wood. 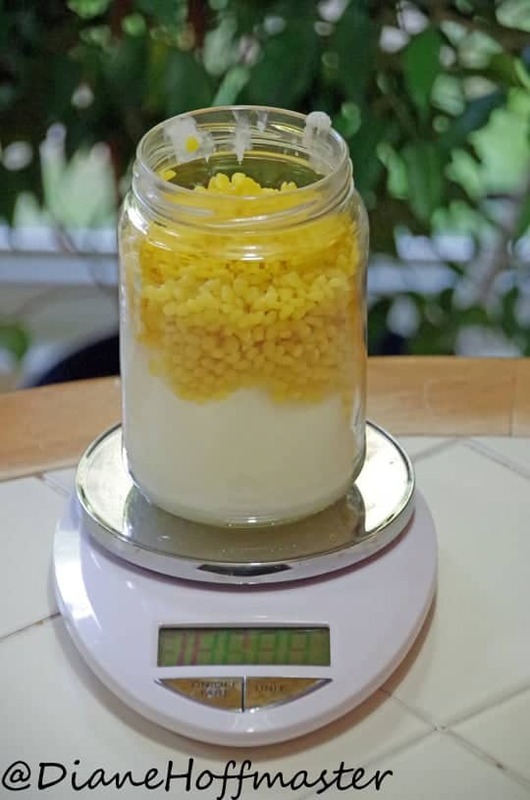 Buy some beeswax granules. Buying beeswax in bars might be a little cheaper but it is really hard to chop and takes longer to melt. The essential oils in this wood butter are optional. I chose clove oil and rosemary oil because honestly I love the scent and they both have mild antibacterial properties which may help deter bacterial growth on your cutting board. You can use lemon oil or choose whichever essential oil really appeals to your senses. Check out The Huffington Post for ideas on using essential oils to clean with. Some people use straight bees wax for wood cutting boards but I don’t think it spreads well or smells as good as wood butter. 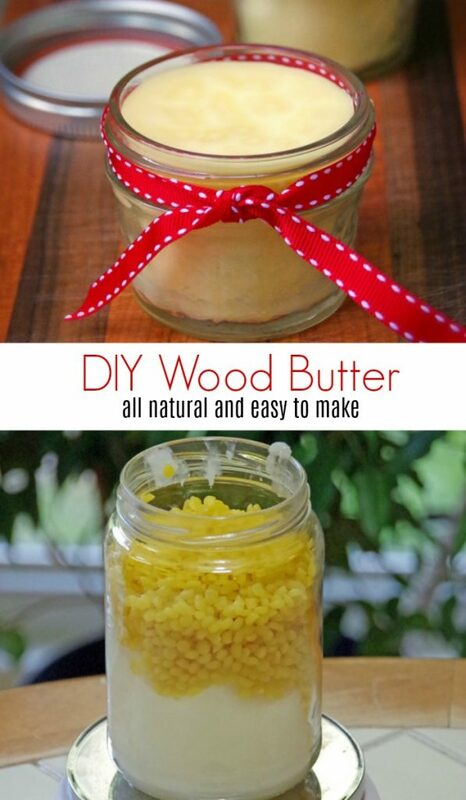 This DIY wood butter would make a great gift for the foodie in your life! This recipe made about 16 ounces worth of wood butter. I put about 4 ounces in each of 4 small mason jars with lids. It will stay good at room temperature for quite a while so you can either hoard it all yourself or use jars of wood butter as homemade gifts. Once everything is melted together you just pour in small containers and let solidify. If you prefer to use a liquid cutting board oil recipe, you can use it before it solidifies. Once it hardens, use a paper towel or clean rag to spread the wood butter all over the surface of your clean cutting boards. Apply liberally and then let sit for a couple of hours. Wipe away excess with a clean cloth. Now you have happy, well-moisturized cutting boards that should hopefully not break in half the next time you use it! Exact wood butter recipe and directions for use are below! An easy and natural way to moisturize your wooden cutting boards! Put the jar into the pot of water and heat the water over medium heat until it is simmering. Stir the coconut oil/beeswax mixture until everything is melted. The coconut oil will melt quickly...continue stirring occasionally to speed up the melting of the beeswax! Remove the melted oil/was from the heat and add the essential oils. Mix gently and pour into small glass mason jars. Let harden at room temperature and place lid on top. To use, apply liberally with paper towel or clean cloth to a clean cutting board. Apply whenever you think the cutting board is getting dry looking. I absolutely love this. My very good cutting board just split in half from being dry. I could have used some of this but now can make it, thank you! I have lost a LOT of good cutting boards over the years. Hopefully this will help! Great post and I love the wood butter recipe. I'm planning to make some for me and will try to remember it for making Christmas gifts, too. Good luck and I hope it helps with your cutting boards. You can use it on wooden spoons, too. Great gift for foodies!